I think I’ve mentioned a few times….I like Horror. The first grown up novel I ever read? “The Cement Garden” by Ian McEwan. For those who haven’t read it, it’s worth a look. Imagine mixing “Party of Five” into a slurry of “Lord of the Flies” and throw in a little dash of Edgar Allen Poe for taste. now imagine Jennifer Love Hewitt and grown-up Lacey Chabert are Ralph and Jack…and they get into a cat fight..and…uh..sorry, got a little distracted there. The Cement Garden might not qualify as horror in everyone’s book, but to an imaginative twelve year old, the images of the slow dissolution of the family, paralleled by the images of the decaying matriarch under that thin layer of concrete…well, those things populated my nightmares for months. After that, I discovered Peter Straub, John Saul, Ramsey Campbell, and of course, the big guy – and it was all over. I was hooked. It didn’t take long for me to throw my lifelong ambition to be a Paleontologist into the trash heap, to trade my metaphorical pickaxe and safari hat for a typewriter (and a safari hat…I wasn’t giving up the safari hat). I was going to be a writer, and I was going to write scary stuff. After attending Friend of KnippKnopp Kathryn Craft’s kickoff party this weekend (for the Art of Falling, available at Amazon, Barnes and Noble, and fine bookstores everywhere), and thinking about her long journey to publication, I started thinking about my own. 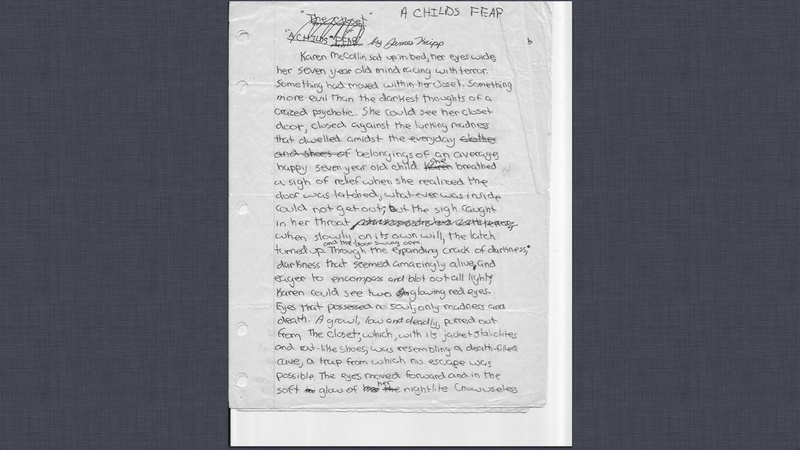 So I dug into the trapper keeper and pulled out my first horror story, written at the tender age of thirteen. Here it is….warts and all. Karen McCollin sat up in bed, her eyes wide, her seven year old mind racing with terror. Something had moved within her closet. Something more evil than the darkest thoughts of a crazed psychotic. She could see her closet door, closed against the lurking madness that dwelled amidst the everyday belongings of an average, happy seven year old child. She breathed a sigh of relief when she realized the door was latched, what was inside could not get out; but the sigh caught in her throat when slowly, on it’s own will, the latch turned up and the door swing open. Through the expanding crack of darkness; darkness that seemed amazingly alive and eager to encompass and blot out all light; Karen could see two glowing red eyes. Eyes that possessed no soul, only madness and death. A growl, low and deadly, purred out from the closet; which, with its jacket stalactites and rat-like shows, was resembling a death filled cave, a trap from which no escape was possible. The eyes moved forward and in the soft glow of her night-light (now useless against whatever terrors of the night it was supposed to deter) Karen could see a short, scaly head atop a dog-like body. A thick tail lashed savagely and a noisome slime covered this creature arisen from the deepest pits of Hell. It’s huge teeth were bared to her, and the creature’s mouth was pulled up in an endless snarl. Karen tried to scream, but her terror was so great she could only make a whistling, breathless sound. She retreated, curling her body protectively in a corner. Realizing imminent death, Karen closed her eyes. The creature’s terrifying snarl filled her world, its polluted stench invaded her nose and she held her breath. Suddenly, just as quickly as it began, the growl subsided, fleetly drifted into the depths of her subconscious. Karen breathed and smelled only the clean night air flowing through her window. Opening her eyes, she realized that she had only dreamed. She sat up and saw, to her disgust, that in her terror she had wet herself. She arose, not wanting to remain in her stained nightgown, and started walking towards the bedroom door. Karen stopped, terrified, when she heard the sounds: a click as a latch inexplicably turned and an insidiously evil movement that emanated from the darkness of her closet. 1. I had probably just finished reading Stephen King’s very very scary short story “The Boogyman” out his excellent collection, Night Shift. 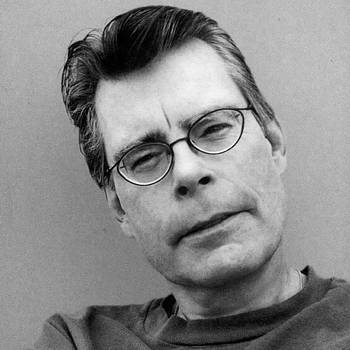 So…What do you think….the nascent stirrings of a future icon of horror? Proof that I probably should have had lots of therapy? Maybe a little bit of both? Vivid sensory imagery. Scary story! Great that you still have your writing from childhood. Embarrassed, I threw a lot of mine away. Glad you didn’t.